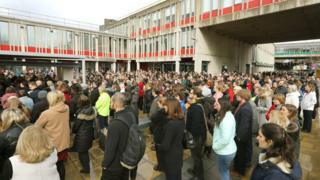 More than 500 people have attended a public event to show support for a university's Jewish Society. The group was founded last week after an anti-Semitism row at the University of Essex, where more than 200 students voted against it being established. Society president Amy-Julie Fogiel was among the speakers at Thursday's event. After what she described as "an emotional week", Miss Fogiel, 18, told crowds gathered at the Colchester campus that "solidarity is priceless". "I'm very proud to be Jewish," she said. "I can't wait to establish the society and continue this journey. Light wins over darkness." Image caption Society president Amy-Julie Fogiel said she was "very proud to be Jewish"
The event was organised by the university's vice-chancellor Anthony Forster to show that "anti-Semitism has absolutely no place" in today's society. He said it was "right" that the Jewish Society had been formed and promised to do everything he could "to enable it to flourish". "We need to ensure that by our actions, the experience of Jewish people at our university is one of which we can be proud." Mr Forster also read out a statement from university chancellor and former student John Bercow, who intervened in last week's row. The House of Commons Speaker said he had been "mortified" to hear of the anti-Semitism row and called on the university to reassert its "core values" in a bid to "cleanse" it of an "ugly and damaging stain". About 300 students originally voted in favour of setting up the Jewish Society, which was formally founded on 22 February. The university confirmed an investigation into claims a member of staff posted racist material online was continuing. Computer science lecturer Dr Maaruf Ali - who has been suspended - allegedly wrote on Facebook that "the Zionists next want to create a society here at our university". Other posts, which have since been deleted, appeared to deny the Holocaust.